FakeOff App - Track Fake Facebook Accounts, Be Safe! It has been proved that many Facebook accounts are not genuine. Perhaps it has become a part of a Facebook now. There is no strict procedure to verify the Account's originality on certain interval from Facebook. Due to leading sales figures and fast popularity many people taking disadvantage of the these social networking sites. Multiple accounts, Fake friend requests and popping into other's personal information has become a new interesting topic at free pass time. Facebook currently have over 1.15 billion active monthly users (MAUs). FakeOff is an initiation by Eliran Shachar- CEO of the company from Israel, enables easy detection of Fake accounts by dividing them into categories such as criminal, psychosomatic and other types and to further identify their risk to social individuals. Approximately 15,000 people worldwide are already using FakeOff App. Data further reveals fake account number is rapidly increasing. Multiple profiles with name alteration, celebrity duplicate accounts for leads is apparently common at current due to lack of in depth surveillance. And why will they do it? To reduce their sales figures? 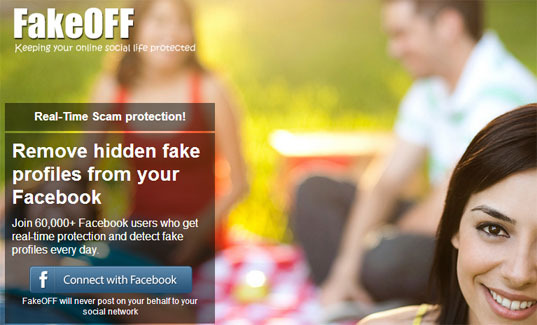 FakeOff App is an initiation towards the social security of online Facebook users. As per Facebook's survey around 14 crores accounts among 1.2 billion Facebook accounts are badly suspicious and they are from developing countries such as India. FakeOff results are anonymous and only accessible by the launching user. This App provides a real time protection against suspicious activities on Facebook and enable users to stay away from the fake account activities. FakeOff detects a list of suspicious accounts and uses an algorithm to identify mismatches and scores them on 1-10 scale. As much as 24 percent of overall investigated profiles on FakeOff have found to be bogus. This app will certainly add an value to the social networking and will surely help restricting spamming. Have you tried FakeOFF App?